There is a tradition that Zion Hill settlers held Methodist class meetings in a building on the north end of Lot 28 Con 2 across the road from the present church, prior to 1843. There was also said to be a large common grave here, where victims of the 1832 and 1834 cholera epidemics were buried. At the January 25, 1845 quarterly meeting of the Dundas Circuit, trustees were named for “the intended Wesleyan Methodist Church at Copper Hill.” Joseph Kitchen gave a plot at the south end of Lot 28 Con 1 in 1845, and the building committee, Isaac Horning, Isaac L.Howell, and William Kitchen, erected a building 40′ X 50′ capable of holding 350 people. It was dedicated September 23, 1849. In 1861, an additional acre was purchase from George G. Kitchen to enlarge the cemetery. In 1869, this second church was replace at a cost of $3,000, by the present white brick church, which was dedicated January 9, 1870. At a dinner next night, the debt was nearly wiped out. Zion Hill cemetery is unique among church burial grounds because anyone may use it for burial. he earliest name for Zion Hill was Copper Hill, and many are the tales to account for this name, There is the story of the singing teacher who was dislike by his pupils who paid him in coppers; and another of a special collection taken up in the church; and still another about paying a minister in such a way that he would get the hint that it was time to move. In each case, the sum of money was large, and all in coins in a paper bag that broke and spilled the coins onto the hillside. And of course, the person involved did not find all the coins, therefore the children kept finding them for years afterwards. The truth is that the settlers in this part of Ancaster came from Sussex County, New Jersey, where there was a similar hill named Copper Hill, so they used the same name here. It is quite possible that the New Jersey Copper Hill got its name from a pilled bag of coppers, and that the legend was imported with the name. 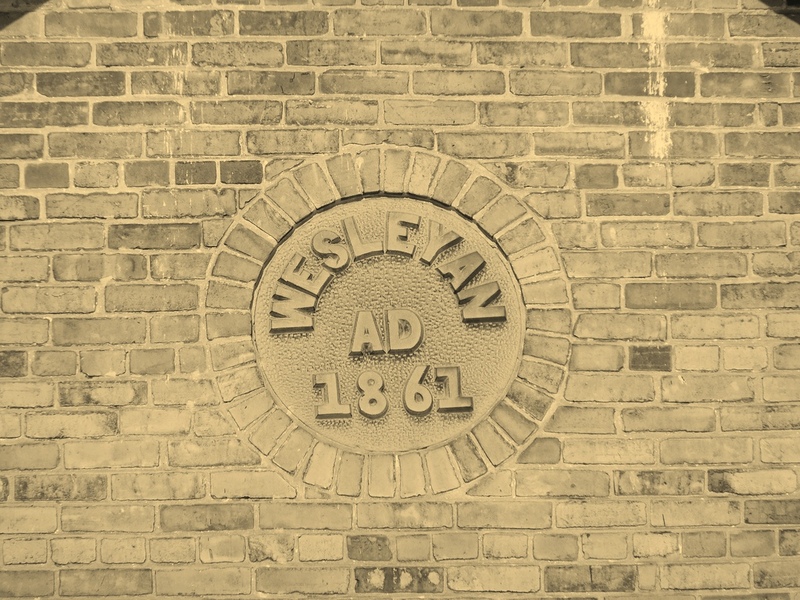 After the lawsuit between Squire Henry Hagle and Peter Bowman over “The Old Slide,” the Ryanites, or Canadian Wesleyans, in 1831 built a chapel three quarters of a mile west of Bowman Church on the southeast corner of Lot 47/3 bought from Israel Dawdy. In its early days this church was called Garner’s Church after William B. Garner (1830-1903) who had a blacksmith shop at the corner for nearly thirty years. When his shop burned on April 23, 1880, it was only by the strenuous efforts of the neighbouring farmers that the church was saved. After Henry Ryan’s death in 1833, his Ryanite schism died out, and the New Connexion folk took over this church in 1842, and renamed it Zion Chapel. It was eventually closed, probably in 1884, and the buiding was sold to Leonard Back, across the road. Its lumber now forms part of the gordon Oakes Barn, but the old Garner’s Cemetery, still in use, remains to mark the spot where a Ryanite church once stood. The 1831 sheepskin parchment deed still exists to show that Israel Dowdy sold the church site to William Smith and others for the use of the Canadian Wesleyan Methodists. 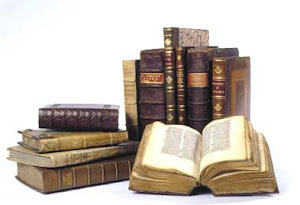 The “others” were James Bates, Caleb Forsyth, Henry Hagle Jr., Isaac Horning Sr., Jacob Horning, Alem Kelly, Jonathan Kelly Sr., William McIntyre, Jacob Miller, and Christopher Smith, trustees. The Ebenezer Chapel was built soon after 1830 by the Methodist Episcopal faithfuls of “The Old Slide” who rejected the Bowman Wesleyan faith. Its location is not known, but it was probably on No. 53 Highway; and it was probably this same congregation who built The White Brick Church. 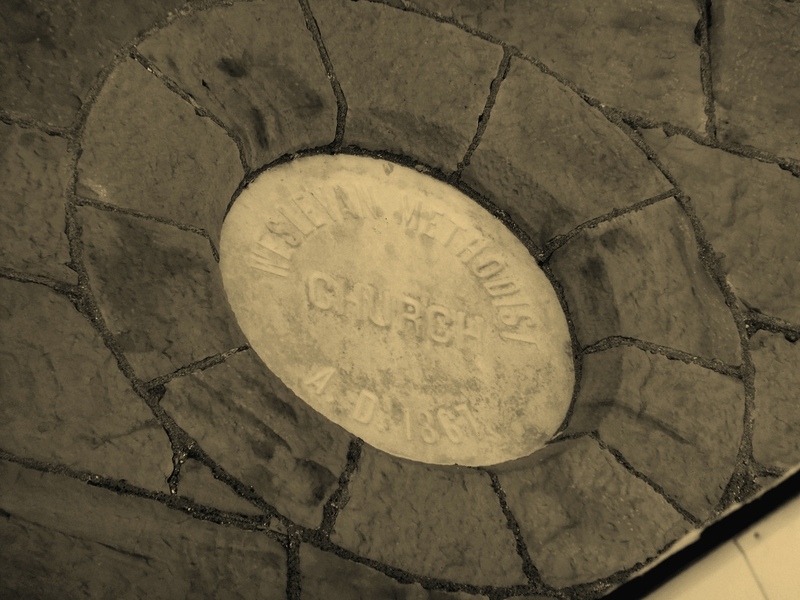 The White Brick Church was dedicated October 11, 1857, and thereafter rendered good service to the surrounding area until the 1884 union of all Methodist Churches, when it was closed except for the Sunday School, and Quarterly meetings which continued here until 1920. Since then, an anniversary Service has been held each June, when a full church honours the past workers whose bodies lie in the adjoining cemetery alongside Elder Bristol and many of his family. Pine trees east of the church were used to build a church driveshed in 1903, but when horses and buggies went out of style, the shed was sold to Lafayette Smith. This church grew out of the old camp meetings held in Shaver’s Woods at the south end of Lot 37 Con 4 around 1907. The church was built with lumber from the Salem Church drive sheds, and flourished for a time, but it too was closed about 1935, and in 1938, parts of its lumber were used to build Bowman Church Hall. 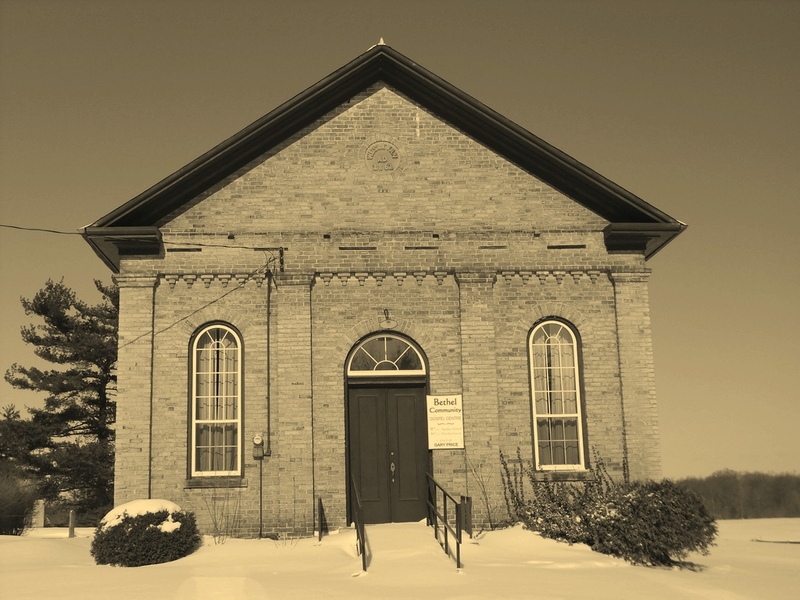 Salem Methodist Episcopal Church was a brick edifice built about 1872 on Lot 48 Con 5 Ancaster, on the Matt Smith farm on the Town Line Road, across the road from the Smuck Burying Ground on Lot 1 Con 4, Glanford. The trustees included Matthew Smith, Secord Smith, Jacob E. Smuck, Ithamar Smuck, and Jacob Crow. Salem was well attended for over twenty five years, but in the 1900’s, the membership began to dwindle, and finally the church had to close after the last faithful member, Matt Smith, gave up around 1905. The church shed were used to build a Free Methodist Church at the south end of lot 37/4. Bethesda Church has its beginning when a group met in the log home of William Shaver (1771-1830) as early as 1825 according to Benjamin Smith’s diary. 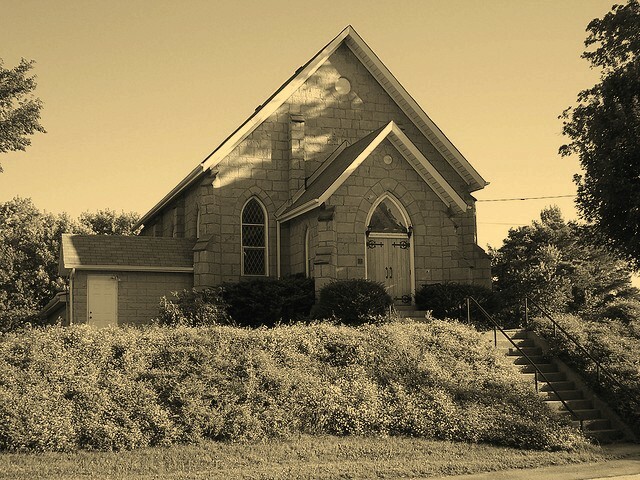 They were known as the Shaver Settlement Methodist Church, and the worshiped in the nearby Bethesda School. They were part of various circuits until 1854 when, with Bowman Church, they became a two point charge. In 1860, John Shaver (1799-1861) left in his will a plot of land on a hilltop for a church and burial ground, with $400 to finance it. His son, Horace (1840-1898), deeded the half acre to five trustees, Orange L. House, Daniel Shaver, David M. Lee, Jacob Albert Shaver, and Egerton Shaver; but it was not until 1867 that work on the church was started on Lot 38 Con 4, Ancaster. Bethesda Church, built by Jacob Cramer from plans made by Austin House, was dedicated on October 4, 1868. In the following years, Alem Kelly, John A. Daniels, and Jacob Shaver have been class leaders, and three member have entered the ministry; Rev. Dr. William Scott Daniels, (1872-1965), Rev. Daniel Shaver Kern (1877-1933), and Rev. William Osborne Bristol (1888-1949) Mr. Kern served a term as a missionary in China; Dr. Daniels’ daughter, Elda, was amissionary in Korea; and Mr. Bristol’s son, Dr. Lyle O, Bristol, served in the Baptist ministry as did his father. Wesleyan Methodists from three townships joined to build Bethel Church on Lot 1 Con 1 Ancaster Twp., at this township’s northwest corner. The land was given on September 17, 1861, by Peter Weaver of Ancaster to seven trustees; Jacob Shuert and Edmund Palmer of South Dumfries, Abner G. Hopkins and Charles Near of Ancaster, and Ensign Buck, James Campbell and Charles Stewart of Brantford Township. Enough land for a burying ground was included. Some of the class leaders of the early days were G. Conn, J.R. Howell, Lorenzo Steward, H. Watson, E. Lampkin, Miss Ella Ramey, and Miss Frances Smith.